Make a button for a buck. Stop in and make your own buttons! We appreciate a head's-up phone call but for the most part, our button machines are always available. We have either a 1" button for $1 or a 1.5" button for $1.50. Discounts apply to quantities over 100. Buttons are great party favors: we've had customers make them for family reunions, birthday parties, baby showers and more. Bring in your own papers or select from our supply of decorative papers; we'll help you use the machine. Photographic paper is too thick but you can print out your pictures on regular paper or get color copies. Particularly for photographs, the image usually has to be reduced in order to fit in the button. 1" button: finished size is 1"; but the paper is cut to a 1.313 inch circle (goofy size, I know, I'm not the engineer who calculated that). That extra paper wraps around the edge of the button and is somewhat visible, though the critical part of your image should be within the 1" circle. 1.5" button: finished size is 1.5" but the paper is cut to a 1.88" circle. If you are a graphic designer, we recommend a "bleed" of .25" beyond the finished size inner circle. If you are printing out several images on a single page, make sure that you leave enough space between them. YOU DON'T HAVE TO CUT YOUR CIRCLES IN ADVANCE: WE HAVE A SPECIAL TOOL THAT CUTS THE PRECISE SIZE. While it might be helpful to draw a 1" or 1.5" circle on the design, it would look best if you could remove that circle prior to printing and delivering pages to us; that circle inevitably shows a bit on the front or edge of the button and doesn't tend to add anything to the finished product. Options include button (pin-on kind, not sewn-on), mini key ring, magnet, button bracelet or button picture frame (prices vary depending on size and frame; purchase a frame from us or bring in your own). NOTE: bracelet and frame require 24 - 72 hours for glue to set and must be picked up the following day. Please let us know what you want to make at the beginning (pin & magnet are made differently than bracelets and frames). Buttons have been made for conventions, bridal parties, poets & more; button frames and bracelets make great presents for birthdays, moms, wedding anniversaries & more. For the two weeks before Valentine's Day and Mother's Day, the craft table is set up for card making. Supplies include: paper scraps, washi tape, glitter, various shaped punches and many other goodies. We supply the card and envelope and you can have a seat and make a card. $2.50 per card. As part of Anthology's mission to facilitate creativity, we offer craft projects at the shop. We supply materials and instruction for you to enjoy some crafting time at our table. 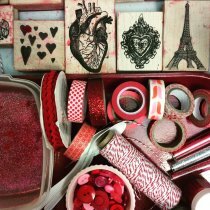 We occasionally have drop-in projects but there are many other projects that you can choose from including decoupage mirrors, altered books, button bracelets, and card making. We've had craft parties including: college students making decoupage mirrors, one bridal shower party making flag books, birthday parties making decoupage mirrors, birthday parties and a Cub Scout troop making comb-bound journals. And we've had parties for all ages, though age 8 and up seems to work best for manual dexterity matters. Even people who say they aren't creative seem to enjoy a short opportunity to work on a simple project! 1. Reservations must be made at least three days in advance. Call as early as possible to make sure your date is available. 2. No more than 6 people per reservation. 3. Prices and projects are subject to change. Please call or email for more information or to confirm your selection. 4. Only one project per party.